NC GreenPower plans to install a small 3-5 kW solar PV array at awarded schools, equipped with monitoring equipment that will send data to a website for students to use in classroom lessons. A new statewide pilot program is giving students an opportunity to learn hands on about renewable energy. New Bern High is one of four schools across North Carolina that received a grant to construct a 5kW solar panel system on site. Earth and Environmental Science Teacher Sandy Parker applied for the grant in Spring of this year and found out three months later that they had received funding. There’s still about $4,000 that has to be raised before the array can be installed. But the plan is to mount several solar photovoltaic panels to an eight foot high pole in front of the high school. The panels, measuring 8 feet by 20 feet, will generate enough electricity to power the average home in eastern North Carolina. But as far as the school’s energy needs, Parker says it will only produce enough energy to power the school’s main office. 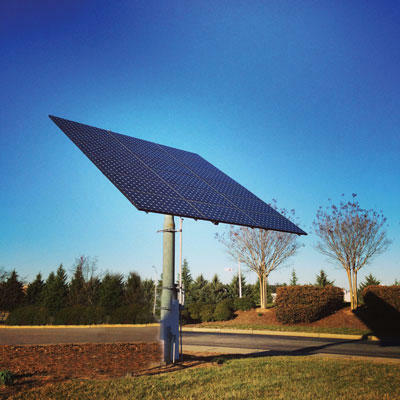 The Solar Schools pilot program was implemented by NC GreenPower, a multi-utility, non-profit renewable energy program based in Raleigh as a way to provide more hands-on experiences and real world connections for students. Marketing and Communications Manager Katie Lebrato says the organization is offering a matching grant of $10,000 to help New Bern High School construct their solar system. In addition to the matching grant, NC GreenPower is also providing curriculum, lesson plans and training to teachers. “We’re inviting all of the teachers who are participating in this project, up to four per school so it won’t be just one educator that’s trained, we’re inviting them all to a training session so they can learn the curriculum that we’re recommending they use along with solar array, we’re providing some supplemental material so they can kind of test out, not just what we think is good curriculum but other resources that are available. Because this is the pilot year of the Solar Schools program, feedback from the teachers is essential in providing a more comprehensive curriculum package in the future. Science Teacher at New Bern High Sandy Parker there are many classroom applications using the solar panels. The instrumentation for the solar panels is computer generated and can be accessed in the classroom, displayed over a projector and monitored in real time. The system will also allow Parker to access archived data. Parker says this allows her students to record the functions of the solar panels over the course of a year. Parker has big plans on how to incorporate the solar panels and renewable energy concepts into the classroom, but the first step is securing funding. So far, students, school clubs, businesses and people in the community have donated about $9,000 to the project. There’s still $4,000 left to go. Even though the deadline for New Bern High to have matching funds has passed, Parker remains optimistic that they’ll raise the remaining money and the solar panels will still go online in late-January. In addition to New Bern High, East Columbus High School in Columbus County, C.E. Jordan High School in Durham County and Meadowview Magnet Middle School in Surry County were selected for the pilot program. Next year, NC GreenPower plans to offer 10 matching grants to schools across the state. For more information on the Solar Schools project, visit http://my.ncgreenpower.org/.